Use category branches to help generate product keywords. 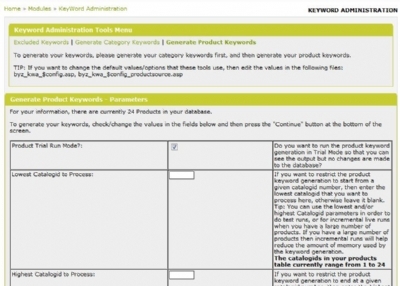 Source your product keywords from as many product columns as you want. Source keywords from normal text columns and automatically strip-out html, translating html-formatted values into valid keywords. Included is our Keyword Template Fields which enables cross selling by keyword links shown on product pages. If you also use the included keyword template fields as well (BYZ107), then you'll have an even more powerful solution. Keyword Tools? What's it for? What's it do? So, you've got lots of data that would be a good source for keywords, but it's spread-out across different columns, and on the categories, and it's not all in keyword format. And you want to somehow translate your category branches into keywords and put those onto the product keywords. How can you bring it all together so that you can generate a nice tidy set of fully relevant keywords on your products? Well, that's exactly what this tool does. One use of keywords is for your customers when they're searching for products on your site (ie not clicking manually through categories which could take forever, but just typing a word into your search mini-form and pressing the "go" button). 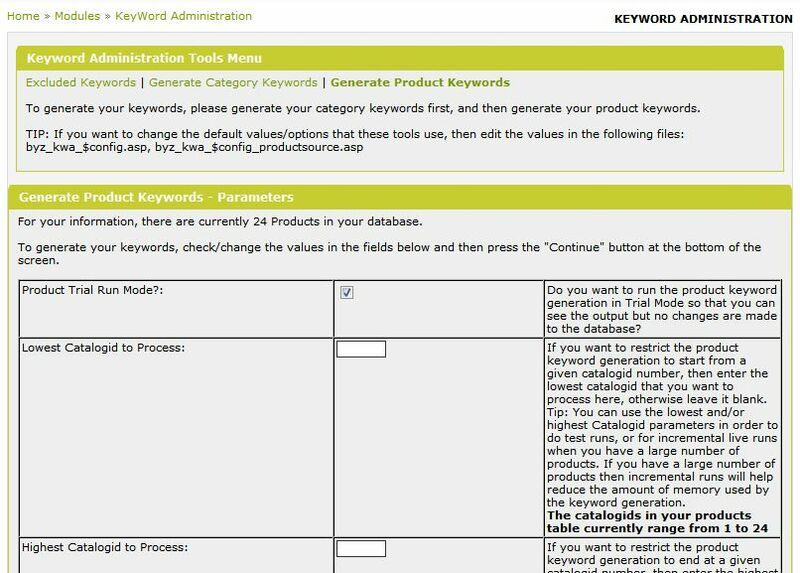 As well as being able to source your product keywords from as many product columns as you want, this tool also allows you to copy-down your category branches/keywords onto product keywords (translating the category descriptions into keyword format), which means that your customers can then find your products by searching on category related words as well as the specific product related words. Customers will get less frustrated when searching, will find many more matches (which will also be more relevant), and so your sales should increase. If you've got a large number of products and the search doesn't hit the relevant items on half the searches, then a lot of potential customers would walk away. But with more relevant keywords attached to the products, your customers will find what they're after much more easily and help drive sales up. To help enhance your search engine ranking, the keywords in your products (which are then used in the meta-tags on your product page headers) will be hugely advanced when using this tool. There are far too many permutations/benefits of how you can use this tool to mention here, so the best thing to do is to play around with the demo, and then you'll get an idea of what it's capable of doing. The category keyword generation is nice/useful, but the tool really becomes the most powerful when you get to the product keyword generation, where you can specify your keyword sources. Play around on the demo; don't worry, you can't do any harm; it won't update anything on the demo version, it'll simply show you the "projected" new keywords after you press the continue button. 02 13-JUN-2007 Enhanced to cater for sqlserver text (memo) bugs. 03 02-JUL-2007 Enhanced to allow better defaulting of category meta-keywords on customer (non-admin) screens. Corrected MySQL sql syntax on preparation (installation) screen. 04 03-JUL-2007 Enhanced to cater for a vbscript error that was showing up when generating keywords when the catalogid column was in the xsortproducts config option. 05 11-DEC-2007 Upgraded BYZ038 (from V07 to V08). Upgraded BYZ025 (from V02 to V03). Upgraded BYZ107 (from V02 to V03). Added explicit command timeouts for database connections. Added defaulting of product meta keywords. 06 10-JAN-2008 Changed to cater for categories.highercategoryid being null or zero for top-level categories (was previously expecting top level categories to be zero only). 07 09-FEB-2008 Added optional catalogid range parameters to allow for incremental product keyword generation runs. Tuned Phase 2 of Product Processing (Getting Product catcalcwords source values). 08 14-APR-2008 Added new config options for maximum generated keyword lengths and corresponding warnings on the generation screens. 09 13-JUL-2008 Upgraded BYZ038 (from V08 to V09). Upgraded BYZ107 (from V03 to V04). 10 16-JAN-2009 Upgraded BYZ038 (from V09 to V10). Upgraded BYZ107 (from V04 to V05). 11 04-JUN-2011 Upgraded BYZ038 (from V10 to V13). Upgraded BYZ036 (from V05 to V08). Upgraded BYZ033 (from V06 to V11). Upgraded BYZ025 (from V04 to V06). Upgraded BYZ107 (from V05 to V07). Tuned to use less memory/resources (and better quality html). Changed to cater for more data types when calculating column source data types. Restructured files to allow for easier maintenance on different vpasp versions. Commented out some of the special raw character translations as they were causing issues for utf8 values. Split README file into separate files for different vpasp versions and for version history etc. If upgrading from a previous version, please note that the installation procedure has changed and there are now 2 includes (byz_kwa_customer_inc_fun.asp and byz_kwa_customer_inc_vars.asp) instead of the single old byz_kwa_customer_inc.asp file which has now been deleted, please see the installation notes for details.